Speaking in an interview with GQ, Mads Mikkelsen, who plays Galen Erso in Star Wars: Rogue One, has let slip that the film will feature three distinct time periods. 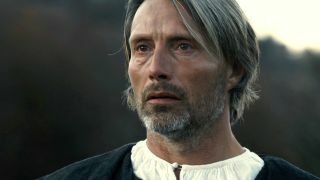 Mikkelsen plays the father of Felicity Jones' Jyn Erso, the leader of the Rebels stealing the Death Star plans, and revealed he teamed up with three actresses playing the part: "I worked with Jyn at three stages, and three different ages, so there was a little kid that was four, one that was eight, and then there was Felicity." We've already seen little Jyn in some of the footage (and check out the secrets hidden in the most recent Star Wars Rogue One trailer) but middle Jyn is new. It suggests we could be spending a little bit more time in the past, setting up the story and Galen's place in it, before big Jyn takes over to cause trouble for the Empire. Directed by Gareth Edwards and starring Felicity Jones, Diego Luna, Riz Ahmed, Ben Mendelsohn, Forest Whitaker, and Mads Mikkelsen, Rogue One: A Star Wars Story is scheduled to open in UK and US cinemas on December 16, 2016.